This committee will help guide the effort to get grant funding to allow the students to design an improved playground at Hawthorne Elementary School. Committee membership is open to all members of the school staff and the neighborhood community (not just PTA members). The Neighborhood Matching Fund grant program requires a community match of 1/2 of the amount we are requesting. The community match value may include volunteer time, cash, donated professional services, and/or donated supplies. Individuals can contribute their time to a project in a variety of ways: such serving on planning committees, attending events, promoting the project, and more. Volunteer time is valued at $20/hour. This is a community project so anyone can participate! Please fill out the online pledge form, even if you have done so already (some previous pledges were incomplete and won't count). Make sure to include all members of your family, everybody counts! Hawthorne is a Creative Approach School that provides students with Project Based Learning opportunities aligned to academic standards through our STEAM Program (Science, Technology, Arts, and Mathematics). The focus of the STEAM model is to further enhance student learning by integrating STEM coursework with the Arts through real world project based learning experiences. STEAM programs add art to STEM curriculum by drawing on design principles and encouraging creative solutions. Students would work with design professionals to develop a new play area. They will work through the process of outreach, design, feasibility, budgeting and more. We just need to apply! Currently the only access to the playground is on the east side of the school. 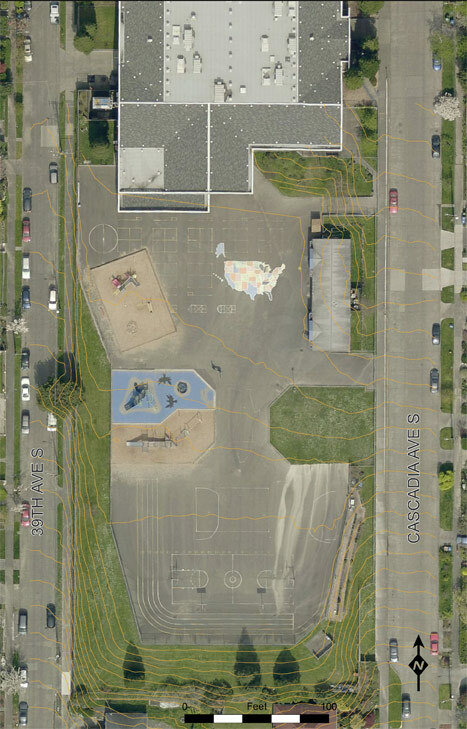 By adding an entrance to the playground on 39th Ave S neighbors would have easier access to the playground and facilities. Bus and parent drop off now occurs on Cascadia Ave S. This mix of vehicles and students is chaotic and potentially dangerous. A new access point to the school would allow drop-off and pickup of students separate from the bus loading zone. Anyone who wants to be involved in shaping this multi-year endeavor or find out more should try to attend the Committee Information & Pre-Planning Meeting on April 4th, 2017 from 5:00 PM to 6:00 PM in the Library (before the FOH PTA Meeting.) All school, staff, neighbors, and community wide members are welcome. For more information contact the committee co-chairs Pete Intravartolo (peteintro@gmail.com) or Peter Schumacher (schumacher.p.j@gmail.com). This is not a design meeting, but will focus on general direction and grant writing.